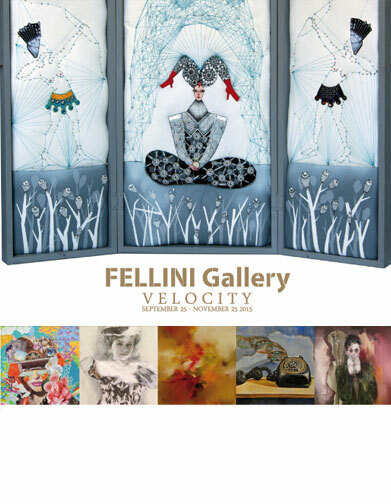 FELLINI Gallery is proud to present a group exhibition “VELOCITY" by Rike Beck,Marius Dan Focsan, Gérard Mursic, Yoh Nagao, Maika Romanow, Gustavo Sigal. VELOCITY refers to the rate of motion, speed and action. Measuring the speed of vehicles, runners or a cyclist can be swiftly done with a mathematical equation, yet how can the artist capture the intricacy and perplexity of movement and elapsed time? FELLINI Gallery invites you to delve into the creative processes of six international artists who have transmitted diverse move-ments, events, cultures and society from the past, present and fantasy on canvas. Each artist demonstrates his or her own unique style in an exhibition which reveals the VELOCITY of change. Through vibrant colors bursting, blurring, swirling, fading and morphing, the artists present their emotions and interpretations of action, daily life, human nature and times passed. By investigating the changes in the world and human nature we are able to imagine or construe our possible future through which the rate of time passing seems ever increasing.